1968 Shelbys used two different fog lights. Finding information on these lights has always been a challenge. On this page, I will describe, in detail, some things for you to look at when you examine these lights. When 1968 Shelby production started in the fall of 1967, the fog light used was the Marchal. More specifically it was the Marchal, Fantastic model 656. This light was made in France. This lamp was originally intended to be used on all 1968 Shelbys. The light has been reproduced. The reproduction lights do vary slightly from the originals. 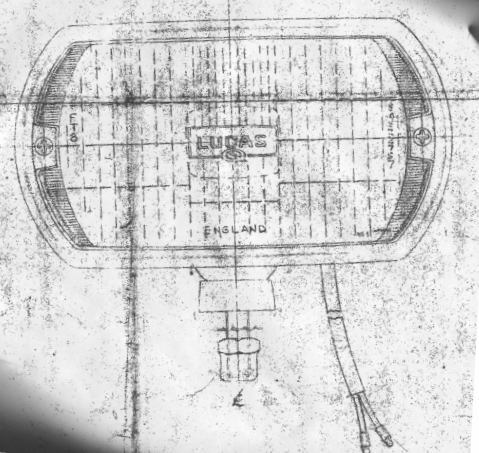 Here is the original blueprint drawing of the lens. All original lenses would look like the blueprint. Please note it does not have the numbers 656 cast into the lens. This lens is very unique as the center protrudes outward like a bullet. 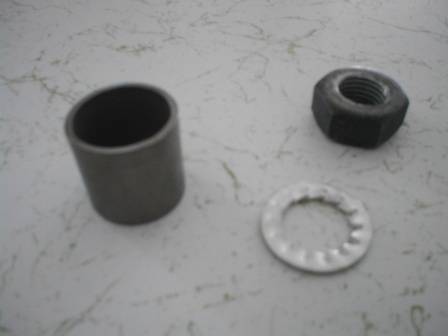 Here is the Marchal Fog Lamp spacer and nut. The thread size is not a standard US thread. Here is the lamp as installed on a concours 1968 Shelby. The housing is entirely chrome. The lens retainer is also chrome and is plain on the top without any numbers. I found this original lens in Beriut, Lebanon. Original Marchal parts are still available with a little searching. The bulb is the size of a golf ball. I have also seen halogen versions of the bulb, but I think they came much later. On 3/14/68 A Shelby Service Bulletin [Technical letter No. 4] was sent to all Shelby dealers. The technical letter explains that the 10 amp circuit breaker installed the factory is insufficent for the Marchal lights. It recommends replacing the circuit breaker with a 25 amp unit. This circuit breaker is located under the dash near the fuse box. It also indicates that replaced circuit breakers should have red paint on the ends of the threads. On 10/09/68 Shelby sent out a letter to owners explaining that the State of California had made a determination that the fog lamps installed on 1968 Shelbys were not acceptable. The letter does not specify a specific reason, but it is assumed they were too bright. Shelby offered dealers the opportunity to replace the lamps at no charge. No other information was provided. Some states also had laws specifically regulating the placement of auxillary driving lights on vehicles. In some cases, it was illegal for them to be mounted level or above the centerline of the headlights. The Marchal light was replaced by the Lucas Square 8 lamp. The Square 8 was a very popular fog light. The correct lens is fluted all the way across and says "ENGLAND" on the bottom. Several close variations have been available over the years. The most notable versions are a lens that says "Foreign Glass" and one that says, "Made in England" on the bottom. The version shown here is the correct production version. The other versions came after Shelby production ended. 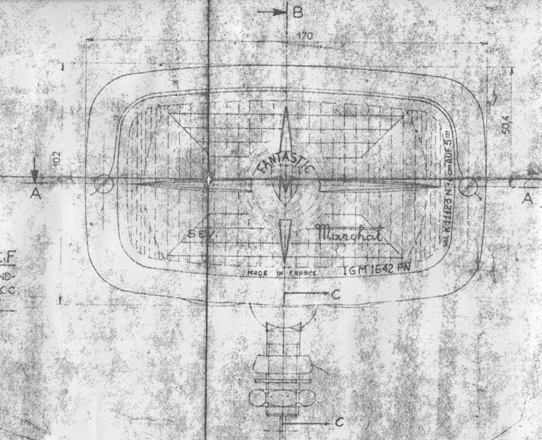 Here is the orignal Shelby blueprint drawing of the lens. 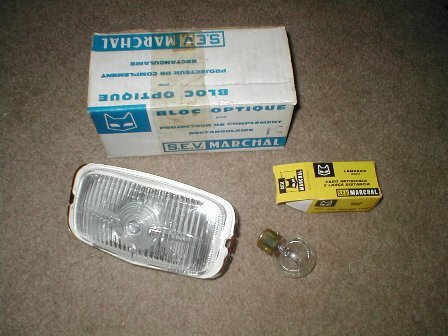 This fog lamp was also used as replacement for all Marchal lamps. The fog lights are tucked into the grille opening and did not come with plastic covers from the factory. If you have the plastic covers, technically they are incorrect. The housings on the Square 8 lamps are all chrome. This same light was also used on the 1969 Shelbys. The lens was flipped over and the light was mounted below the bumper. I am not exactly sure when the change from Marchal to Lucas occurred. The changes in the wiring of the lamps do provide some clues. It is apparent that there were several methods of wiring fog lamps at the factory. The two most common methods are listed below. All 1968 Shelbys used a Mustang Fog light / Headlight harness. This harness is sometimes called a "GT" harness and also has integral wiring for the tachometer. The easiest way to identify a "fog light" harness is the presence of two light, blue connectors. These connectors are located at the bottom corners of the radiator. The first wiring method involves the use of a short Ford connector (15A211) attached to the blue plug. This connector is then attached to the fog light wiring with two white, scotch-lok connectors. The second method requires the use of a small brown tube connector. 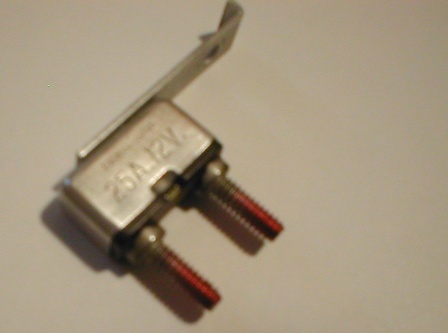 This connector converts the male bullet of the blue connector in the headlight harness into a female connector. The fog light wiring can then be plugged directly into the headlight harness. This change likely happened during the last week of March or the first week of April 1968. This picture shows the mounting pedestal, nut and tube connector used on the Lucas lamps. The mounting pedestal is dished. This along with a movable carriage bolt in the lamp housing, allows the lamp to be adjusted. I would expect all cars built after April 5th to have Lucas lamps. Cars built before this date may have either the Marchal lamps or the Lucas driving lamps, if the Marchals were replaced.